One member of Pantsuit Nation, Susan, shared her story with the group and has since seen an overwhelming amount of encouragement and love. A day after the election, Susan received an anonymous letter from a neighbor complaining that the rainbow flag on her home made them feel “uncomfortable.” She originally hung the flag after the tragedy at Pulse nightclub in June to show support for the LGBTQ community. The letter shocked and hurt Susan. 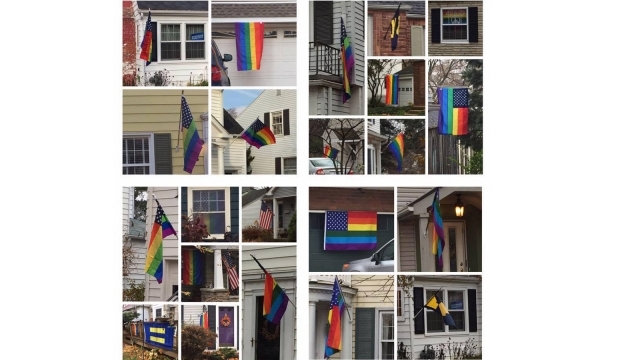 After she shared the letter with some neighbors and her neighborhood email list, her neighbors began hanging up rainbow flags. More than 20 flags were hung as a sign of support—including a few HRC flags. The simple display of an HRC flag on your home, dorm room or office or HRC sticker on your car, laptop or elsewhere shows that you believe in a world that does not discriminate against anyone and that we are in this fight together. Purchase an HRC flag at hrc.im/flag and get your free HRC equality sticker by visiting hrc.im/Sticker. The day after the election I received a letter in my mailbox without a return address. It proceeded to explain that a “neighbor” had walked through my neighborhood and upon seeing my rainbow flag felt “uncomfortable”. The letter went on to “explain” that my rainbow flag was disrespectful to the American flag. It was signed “your neighbor”. Needless to say I was shocked. I live in a very blue city in an even bluer neighborhood (unfortunately in a newly red state). A college town with a diverse population and my neighborhood reflects the diversity. Shaking and crying I shared the letter immediately with a few neighbors. I also sent out a response to our neighborhood email list. Please know I didn’t think for a moment it was one of the people on my street. I believed it was someone close by who now felt emboldened to shame someone flying a flag in solidarity with LGBTQ sisters and brothers. I had started flying the flag the day after the PULSE Orlando massacre. How did my wonderful, loving neighbors respond? They built a wall of flags. Love will always trump hate.